I ain’t ever been nothin’ but a horrible movie. 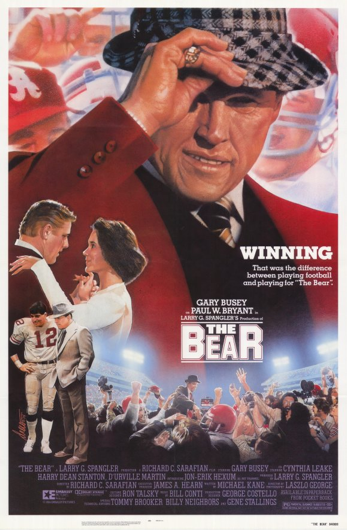 Consider yourself lucky if you didn’t know this, but back in 1984 a biopic on Paul “Bear” Bryant was released starring pre-crazy-inducing motorcycle wreck Gary Busey. It was simply called The Bear, it was written by the man who helped gift the world Jaws 3-D, and it apparently required an Auburn man in order to achieve anything close to gridiron realism. Chet Chessher, a former defensive lineman for the Tigers (1977-80) who graduated from Auburn in 1982 with a minor in theater, auditioned for the part of Joe Namath and was actually called back for a second reading. He didn’t get to play Broadway Joe (too much class and too little drinking, we presume), but he did get the one-line, two-word role of farm boy Timothy Gallagher, supposedly one of the first players Bryant recruited as an assistant coach. When Busey asks him if he’ll play for Alabama, he replies: “Yes, sir.” It’s sickening. But when The Plainsman interviewed him for a story on the movie in December 1984, Chessher insisted his loyalty remained firm. We can’t find much information on Chet. The Plainsman said he also appeared in 1984’s Tank, which might help explain that Auburn plaque in C. Thomas Howell’s room. But IMDB doesn’t list him in that movie’s credits, nor Pia Zadora’s Voyage of the Rock Aliens, which was supposed to be his next project. As of the mid-’80s, he was in Atlanta pursuing a career in modeling and acting, but if he is the “Chet Chesser” included on this Niceville (Fla.) High School Class of ’77 tribute page, than he’s no longer with us. War Eagle forever, either way. i think i made the call on the “tank” plaque, but now i must confess that i saw “the bear” in the theater. yep, tiger brothers and sisters, i grew up a full-aggro bama fan, and remember being in a strangely empty theater to watch buddy holly play bear bryant. i even remember the scene of him picking out his first houndstooth hat. i also remember winning an autographed 8×10 of the bear through reading (probably buying) a certain number of books through those reader forms in elementary school. i cheered against auburn and bo during my first visit to jordan-hare, the southern mississippi game in 1986. i named my dog after joey jones, and had a cornelius bennett jersey. this didn’t change until my embarrassment over the shameful treatment of bill curry after the ’89 season, which coincided with my matriculation to the wonderful plains in the fall of 1990. a bachelor’s degree would come 7 short years later, but i am an auburn man for life. this has been my confession. my shame is laid “bear”. i will say 100 war eagle’s and 50 bodygetta’s, and fast for the rest of the day, in the hopes that i am forgiven for my youthful indiscretions. Chet was part of that Florida pipeline thing that Barfield had going at the time. He was a good guy – about as friendly a person as you would ever meet with a sunny disposition and always a smile. No matter how hot, brutal, or ugly it got on the practice field, Chet was still positive…A real ‘Auburn Man’ in that respect. Sadly, you are right about the “tribute” page find….Chet has gone on ahead of us, but I’m sure he enjoyed the hell out of that championship. War Eagle Chet! I admit to seeing the movie at a theatre IN AUBURN (can’t remember which theater). I have a VHS of it as well that I got off eBay a couple of years ago. I am in the movie as they used shots from the 82 game (I think, or maybe 81) and I was in the AU Marching Band at the time. It is a horrible movie with many bloopers–such as the scene where Bear is visiting a recruit in the late 60s and you can see early 80s cars in the background. Sad to say, I saw it too. I remember there was some issue of the Bryants not signing off on the movie so it had to be shot elsewhere other than U of A? Honestly, at the time, I didn’t think it such a crappy movie. Whew! Rented the Best Picture nominee “Winter’s Bone” the other day, and just when I was thinking how backwoods them Ozark mountain folks are, i spied at the top of the frame, a dadgum AUBURN 22-14 ’04 car tag hanging on the wall… SON OF A…! The movie is set in Missouri…what gives? I went to high school with Chet- yes he is the Fallen Eagle listed on our classes website. I saw him at the ’87 reunion and he talked about this movie. Sadly, he passed a few years after that. In high school he was one of the more popular kids- and deservedly so. It might be worth noting that Chet wore #34 as a FB during the 1977 season.